Some rain is possible tonight, especially after midnight, as the front lifts northward as a warm front. 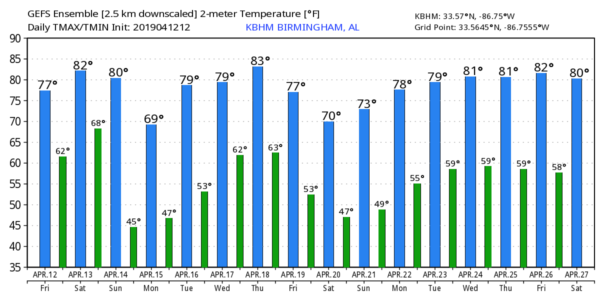 SATURDAY: The warm front will move into Tennessee, and most of Alabama should be dry Saturday with just a few widely scattered showers. The sun will break out at times, and the high will be close to 80 degrees. SEVERE WEATHER THREAT SUNDAY: A dynamic weather system will push a band of strong to severe thunderstorms into our state after midnight Saturday night into Sunday morning. 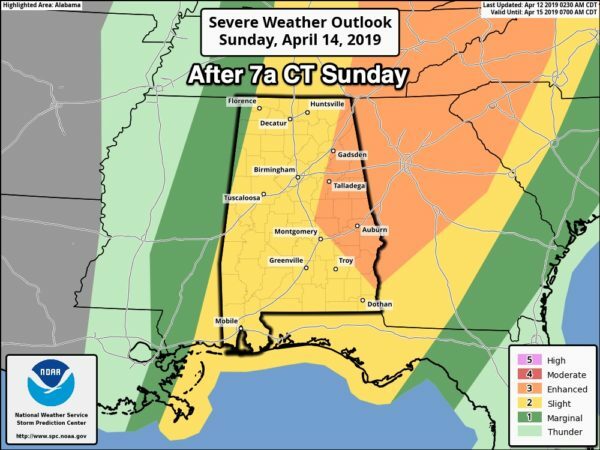 The Storm Prediction Center has far west Alabama in an enhanced risk (level 3 out of 5) of severe storms in its outlook that runs through 7 a.m. Sunday, and all of the state is in some type of risk on the outlook that is valid after 7 a.m. Sunday. An enhanced risk is defined Sunday for the far eastern part of the state. 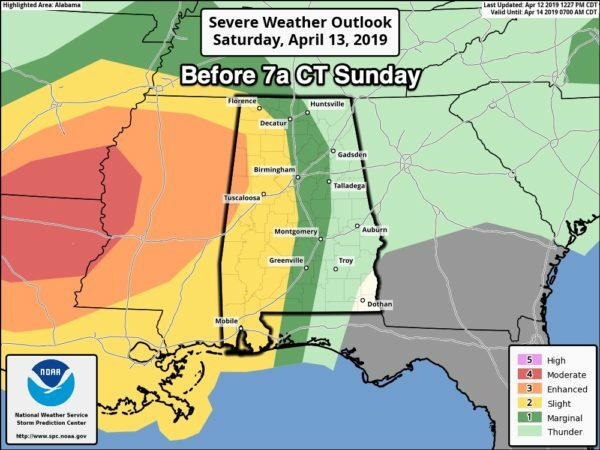 IMPORTANT: I am getting many questions concerning the inconsistencies in the severe weather graphics coming from the National Weather Service offices in Birmingham and Huntsville and the Storm Prediction Center. I generally post severe weather outlooks from SPC. I don’t use graphics from NWS Birmingham because they leave out Cullman County, which is confusing (Cullman County is in the Birmingham TV market, but served by the NWS in Huntsville). Occasionally local NWS offices have a difference of opinion, and the outlooks conflict. Please do not get too caught up in risk categories and map colors. Just understand all of Alabama has a severe weather threat after midnight Saturday night into Sunday morning. TIMING: The core severe weather threat will come from 3 a.m. until noon Sunday. Another batch of thunderstorms will develop later in the day Sunday (3-7 p.m.), and some of those storms could be strong across northeast Alabama, but it remains to be seen if there will be enough instability and moisture for them to become severe. THREATS: Storms could produce hail, damaging winds and a few tornadoes. New model guidance is showing a mass of thunderstorms along the Gulf Coast Sunday morning, and if that verifies it would help to reduce the severe weather threat over the northern two-thirds of the state. Let’s hope we just get away with some noisy storms Sunday morning with gusty winds and heavy rain; that is a real possibility. But we still have to be prepared for severe storms since the Gulf Coast thunderstorm complex isn’t a lock. RAIN: Rain amounts of 1 to 2 inches are expected; no major flooding issues are in the forecast. CALL TO ACTION: Be sure you have a way of hearing warnings. Every Alabama home, business and church must have a NOAA Weather Radio, properly programmed and with a battery backup. Be sure WEA (Wireless Emergency Alerts) are enabled on your phone. Know the safe place in your home and have helmets, portable air horns and hard-sole shoes for everyone in the family there. If you live in a manufactured home and are put in a tornado warning polygon, you have to get out. Identify a shelter or other safe structure that is available during the pre-dawn hours on Sunday morning. Every church should review its severe weather plan. No need to be anxious about this; we are in the core of the spring tornado season, and having threats like this is common this time of the year. Just have a way of hearing warnings, and a good action plan. FOOTBALL WEATHER: Both Auburn and Alabama play their spring football games Saturday (1 p.m. kickoff in Tuscaloosa; 3 p.m. kickoff in Auburn). There’s just a small risk of a shower in Tuscaloosa; otherwise, it will be partly sunny and warm at both stadiums, with temperatures around 80 degrees at kickoff. NEXT WEEK: Monday and Tuesday will feature sunshine in full supply; lows will be in the 40s. The high will be close to 70 Monday and in the 77- to 80-degree range Tuesday. Wednesday looks dry; then we will deal with another round of storms late Thursday and Thursday night. Those could be strong, possibly severe, but we need to get through Sunday’s storms before we can focus on that threat. ON THIS DATE IN 1945: A series of significant tornadoes raked Oklahoma, Arkansas, Missouri and Illinois. Antlers, Oklahoma, was nearly obliterated by a massive F5 tornado that zigzagged from southwest to northeast across the town. 69 people died in the twister. Another tornado killed eight people in Oklahoma City. The disaster was overshadowed by the loss of President Franklin Roosevelt, who died suddenly at his vacation home at Warm Springs, Georgia.